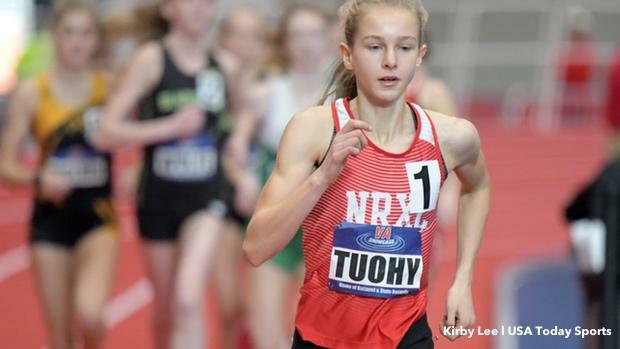 LYNCHBURG, VA -- North Rockland (NY) High sophomore Katelyn Tuohy smashed the American high school national indoor record in the 5K at The VA Showcase on Saturday. It was her first try at the distance. The race continued a remarkable string of performances for the recent Nike Cross Nationals winner, who has set over a handful of records in the past few months. She demolished Brie Oakley's former mark of 15:55.75, set by the Grandview (CO) High graduate last year at New Balance Nationals Indoor. She also ran the fastest overall high school time for girls in the 5K ever, indoors or outdoors, besting Mary Cain's 15:45.46 from 2013. "I went out a little fast and paid for it at the end," Tuohy told Jim McGrath about 20 minutes after a cool-down run. "But, no risk, no reward." Tuohy's mark currently stands as the fourth-fastest indoor performance in the world and for Division I collegiate women and is just a shade slower than University of New Mexico freshman Weini Kelati's 15:37.03 from December. It would also stand as the current U.S. No. 2 boys performance of 2018. "Since this her first time running this event on the track, our only plan was for her to be consistent through the first 4000," North Rockland coach Brian Diglio told McGrath. "And lap after lap, she didn't get more than a second or two off-pace." Diglio maintained Tuohy went through her splits at exactly 37-38 seconds the entire 25 laps, never wavering once, not even when she went through the bell at 15:00-flat. She remained consistent through the swell of cheers, with each step toward her prodigious finish. Her effort also marked the eighth straight season that the indoor 5K girls national record has gone down. It was evident even in the first few laps that Tuohy was on to something special. The high school underclassman cruised out to a 4:54 opening mile -- faster than any girl had run over the invitational sections -- and then to a 9:54 two-mile, which put her in position to secure the incredible mark. According to Diglio, there is no plan for Tuohy to make another attempt at the record anytime soon, as she will gear up for a mile run at the Millrose Games -- she ran a best of 4:43 in the Millrose trials as a freshman -- and then her team at the sectional and New York state meets. Tuohy, however, does have one more goal for the season. "I'd like to go sub-4:40 at Millrose," she said. No. 4 in the WORLD!! The field behind Tuohy didn't fare too bad, either, with Blacksburg sophomore Kaitlynn Wolfe (17:46.03) and Eastern York's Maddie McLain (18:01.12) landing the U.S. No. 2 and 3 performances, respectively.